The field you are standing before seems to have the exact proportions of your own life. [in the singular] a mental picture of a future or anticipated event. A person regarded as likely to succeed as a potential customer, client, etc. An extensive view of a landscape. 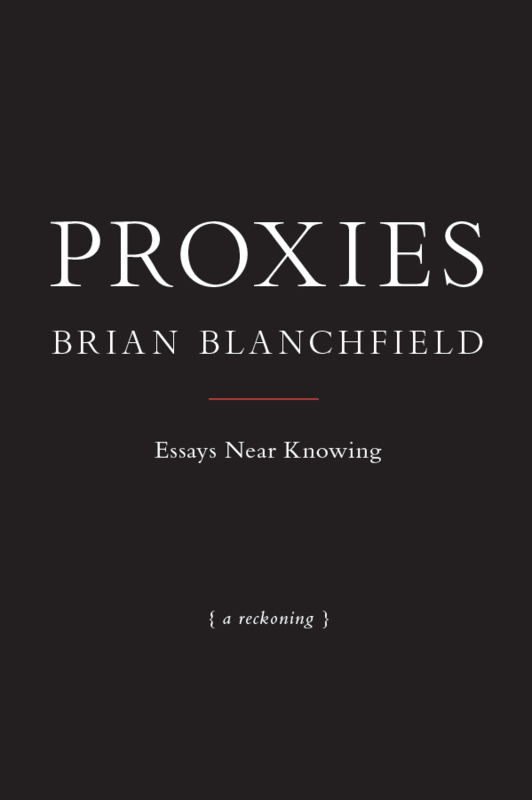 The ironic gut of Brian Blanchfield’s Proxies arguably can’t be better framed than it is by the early disclaimer we encounter on the title’s verso: “This is a work of literary non-fiction in which there are accounts of lived experience. The author has tried to recreate events and conversations from his memories of them. Some names and identifying details have been changed to protect the privacy of individuals.” It is the implicit clash between these caveats—the protectionism, privacy, and the exposure of Blanchfield himself to the electric light of our attention—that forces a more considered play with formalism as the more assertive atmosphere across this sequence of vignettes. “Choice,” or the arrangement of Blanchfield’s own choice-subjects, is perhaps the book’s subject, but Blanchfield lines each of his asides with the sense that choice always inherits the terms of compromise. If it’s a curatorial sensibility that marks a focus, its compromise that scans as this work’s locus. What he chooses to show, the various points he accents as worthy of illumination, charge the ways in which he wants us as interpolated within his election of value. That pins the book down—it is Blanchfield’s book, on the overall—an interrupted memoir—and as we move from the inner to its contents, we see a list of efforts striving to activate ideas. To turn them on is more like television than electric light; the index finger is on the remote, and the channel hops from the static, white page to a series of impressions. “On Owls;” “On Completism;” “On Propositionizing;” “On Peripersonal Space;” “On Tumbleweed;” the list carries on and over…. Turning any of these images “on”—in this case—means fattening the picture with personal interjection. It becomes less and less a question of the interred subject matter… more and more an exercise in personal enterprise – a picture of an author as the apotheosis of a particular verb, an exploration of the ways in which we anchor value, personally, and antedate any new discovery with personal experience. It’s a program that Blanchfield tries to play back against us. Personality is thereby put to the test here. Its an associative principle—a registered proxy, in itself rather than simply a formal device. Its an explicit methodology with which to screen experience. “[I’m] trying to locate my subject,” he writes, only to underscore this aspiration repeatedly, but, at each stage, Blanchfield admits a concession to any particular effort to situate his focus. He admits, time and again, that all he can do is invent—reinvent—and reedit. Every choice, a compromise: an invitation for alteration and affect. As the emphasis drifts from the conditions of genre, to the trappings of form, to the specifics of place and the myriad details of biographical life, the value of any picture grows with its fabrication—its reproduction—and accrues more gravitas with the book’s duration. That’s the marketplace that Blanchfield insists upon; one in which we look for harmony amidst the hundredfold ideas that line the shelves. Turning an idea on is just another way to term our assimilation, another way to invite our possible intervention. In such a sense, perhaps it could as such be suggested that Blanchfield employs the “essay,” formally speaking, to satirise our passion for non-fiction. Each essay—“On Man Roulette;” “On the Ingénue;” “On Withdrawal” and on—enacts a passionate playing out of the context of digital distraction that surrounds this book’s publication. In his arrangement of his subjects, he cannot avail his tendency to parse them through his own persona as a perspectival rule and thus they become capitulated pictures of nothing other than a want for distraction. A lust for something outside our frame of reference; a search for a subject. Thus there’s much more at work here, in Proxies, than yet another return to biography as an obfuscating rule. If it’s Blanchfield we see at the book’s epicentre—striving to locate his subject—he finds it repeatedly, repositioning an array of alien material as, unequivocally, a supportive presence for his attention… a feedback loop that’ll clip against his edges. Aiming to move from the particular, to the general, only to find himself back where he started out from, circulation is ironized as Blanchfield repeatedly entertains the conditions for recreation, for the reproduction of a truth. We say we’re keeping “minutes” when keeping a chronological record of the exchange of information, he claims, but this “1:1 scale” is parodied constantly. Our aim for a fidelity to fact that remains “objective and without analysis” always falls foul of the fine art of the “paraphrase”—everything is subject to change and alteration. The paraphrase, as a way to privatise the public idea—to re-own it, rerun it, reclaim it—can be sat as at the heart of Blanchfield’s work. It anchors the fact that he seems be framing a slide in contrast between effective prose and affective experience—between fact, feeling, and the feeling of fact—it’s a play on the commodification of memory: a faculty pictured here like a skipping channel. Its a television in the old sense of the word, the only constant being the fixed perspective in front of the screen. Slowly, as Blanchfield himself increasingly becomes our platform for the exploration of these “variable experiments” in definition, we can differentiate between the location of a general theory of personality as a tight methodology for observation and the specifics of Blanchfield’s own first-person perspectivism. We’re implicated in the terms of his personalism. We don’t remark on what we’re watching; we simply remark that we are watching—reading—trying to force a verb whilst our name makes an adjective of any action. Every description, slowly, is sequestered as a self-portrait in an imperfect definition. Ruminating on his own relationship with form, the text’s formal allusions provide scope for Blanchfield to interrogate his own relationship with his work as poet. A “poem” is “a durational art,” he writes; “but its running time belies an inclination to reset, to redo. Merely to start a second stanza references the first as a template, suggests their comparability as another track of significance.” In this case, we’ve a unionized view of our standing as critics – an elucidation of the unequivocal labour we all pour into a book to glean meaning. As soon as we’re working with language Blanchfield implies that we’re parodying the very freedoms implied by the form. Blanchfield’s own dependence on memory—the real-godlight of the book, as these pieces all assume an “unresearched” standing “near knowing”—plays his hand on nostalgia back against itself as a remark on the bind between literary form and identity. Personality cannot help but codify itself as a theory of duration, for Blanchfield… a theory of timeliness, and timeliness as imaged through the accumulation of experiences that coagulate as an inescapable picture of the writer himself in the white spaces between competitive digressions. If memory is the governing rule it is ironized here. Blanchfield is quick to note that holding nostalgia as his emphasis underscores the book’s ultimate fallibility. Through his confusion of the personal and the public nostalgias toyed with, he begins dissimulating his subject matter. At such a point it no longer feels like Blanchfield’s book—no longer feels like his train of subjects—it’s a play on language and its prospects. The swollen rhyme, within the context of Blanchfield’s magnified poetry, is key to the melancholy inherent to the greater proportion of his referents. Through Grossman, we’re immediately implicated in the navigation of the social life of language, Blanchfield implies; we register a gentle difference, a totemic “self-othering at the mark of the self-same,” he writes, but any difference is ultimately supportive… projecting a community and engaging a wider sense of our ability to connect. The rhyme, conversely, draws us back to the introversion we can marry to Blanchfield’s expanded poetry. We look for a “rhyme” or harmony, but it’s a personal constellation… something sparked by little other than a structure we’ve already predetermined for our own look to locate our subject. Blanchfield pins this melancholy again through reference; citing Chris Nealson, it’s here that our “secondarity achieves a sheen.” That we’re second in line to our object of attention pictures Blanchfield’s memory some kind of impenetrable surface. Our work follows the fact itself, not ourselves, and sits caught behind the scaffold set on a page, or a screen. Its here, it seems, that Blanchfield appears to want to strike a sense of equilibrium between a writer, in their project, and a reader, in their possible intervention. Proxies, engaging this interest, and somewhat cynically at times, thus approximates the means and methods with which we follow that rule and take a memory to market. Early use of the term, referring to a view of landscape, gave rise to the meaning ‘mental picture’ in the middle of the 16th century, whence it draws in towards the idea of the ‘anticipated event,’ and, in response to its history, there’s a tenable romantic irony to the “prospect” in Blanchfield’s work. Unable to move forwards, in Proxies retrospection and nostalgia become the contextual landscape for Blanchfield’s “prospect”—for his search for a subject. “It can be very attractive in one’s own narrative to replace the given with the leave,” Blanchfield writes; but the leave is always limited. It’s a departure preset by a fantasy already established by the conception of a possible destination. It’s the return journey, for Blanchfield, the round trip that maintains the more important significance here. Consider the “proxy,” ‘Consider the prospect poem….’ From an old hat romanticism onwards, the prospect poem was a platform to look out from. Consider Wordsworth’s ‘Tintern Abbey;’ Hart Crane’s ‘White Buildings;’ consider Whitman’s ‘Brooklyn Ferry.’ The emphasis always shifts…. It’s an active look outwards that only gleans a supportive presence with which to better fix the location of the observer. From that stance, “prospect” becomes possessive. It’s Wordsworth’s abbey, it’s Crane’s building, it’s Whitman’s crossing. Such a thesis dominates so many of Blanchfield’s observations; localization lays a claim to place, to subject. Across the book, we are what we’re looking at. The visible extension of the field in space displaces awareness of your own lived time. By what precise mechanism does it do this? You relate the events which you have seen and are still seeing to the field. It is not only that the field frames them, it also contains them. The existence of the field is the precondition for their occurring in the way that they have done and for the way in which others are still occurring. All events exist as definable events by virtue of their relation to other events. You have defined the events you have seen primarily (but not necessarily exclusively) by relating them to the event of the field, which at the same time is literally and symbolically the ground of the events which are taking place within it. You may complain that I have now changed my use of the word ‘event.’ At first, I referred to the field as a space awaiting events; now I refer to it as an event in itself. But this inconsistency parallels exactly the apparently illogical nature of the experience. Suddenly an experience of disinterested observation opens in its centre and gives birth to a happiness which is instantly recognisable as your own. The field you are standing before appears to have the same proportions as your own life. The “transfer” of interest, from one place to another, is perhaps the “subject” Blanchfield is looking for. His field of inquiry is the adjacency of things—the subject parallel to the matter observed – and the fact that reading, for Blanchfield, is always a highly charged creative enterprise. This is – as many have said in one way or another – the province of poetry, the arrangement of language whereby the sensations of reading are charged with the creative feeling of writing, and vice versa. This is why I reflexively brought my notebook to the television, cued, ready. In Proxies, Blanchfield is always prospecting. Always looking for his subject. Brian Blanchfield is the author of two books of poetry, Not Even Then and A Several World, which received the 2014 James Laughlin Award and was a longlist finalist for the National Book Award. His book of essays, Proxies: Essays Near Knowing, was published in April 2016. Recent essays and poems have appeared in Harper’s, BOMB, Guernica, The Nation, Chicago Review, The Brooklyn Rail, A Public Space, The Paris Review, and The Awl. He has taught as core faculty in the graduate writing programs of Otis College of Art and Design in Los Angeles and at the University of Montana, Missoula, where he was the 2008 Richard Hugo Visiting Poet. Since 2010 he has been a poetry editor of Fence. A 2016 Whiting Award winner, he lives with his partner John in Tucson, where is the host of Speedway and Swan on KXCI 91.3. Dominic Jaeckle is a writer living in London. He writes about reading. Proxies is published by Nightboat Books. Author bio courtesy of same. Posted in Book reviews and tagged brian blanchfield, proxies. Bookmark the permalink.